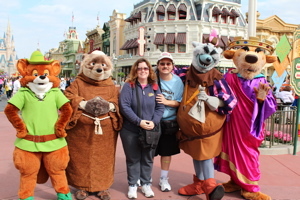 This update will be a mix of old and new, as Long Lost Friends Week has proved quite popular at the Magic Kingdom for Limited Time Magic (below, left). I’ve met all of the characters in the past – and some look similar, some look very different than their former long-lost selves. 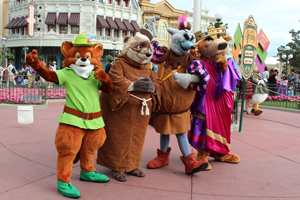 Robin Hood meets guests with Friar Tuck, The Sheriff of Nottingham and Prince John, (below, right) this week! The Orange Bird has landed back at the Magic Kingdom! We signed up for the D23 event, where the unveiling of the Orange Bird was met with enthusiasm. 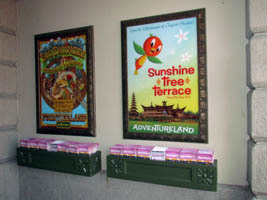 There are new posters under the Main Street Train Station featuring the Sunshine Tree Terrace (below, left). 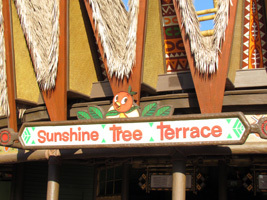 The Orange Bird is now visible above the sign at the Terrace as well (below, right). Yesterday was a full day for us, taking photos of Fantasyland from the Contemporary Resort roof and then heading to the Magic Kingdom! 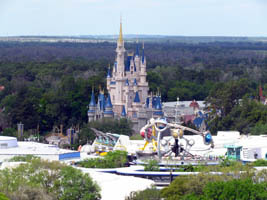 This was our view of Cinderella Castle (below, left). Maurice’s Cottage (below, right) looks quite whimsical! Take a walk through Adventureland as it was in the 1990’s! View a live parrot in front of the Swiss Family Treehouse. Experience the original layout before The Magic Carpets of Aladdin attraction was added and enjoy an up-close and personal view of the drumming Tiki statues! The Tropical Serenade beckons, concluding with a brief look at Caribbean Plaza! Drift through the original foliage canopy into the misty rainforest, setting the atmosphere as your boat heads deeper into the jungle. This version of the Jungle Cruise features the original Jungle boats, the familiar Schweitzer Falls, a flooded Cambodian temple and as always – the backside of water! The Jungle Cruise in 1993 had not yet added the downed airplane but includes all of your favorite classic scenes. Your ride ends with Chief Nami, “Head Salesman of the Jungle” offering “three of his heads for one of yours”! Clyde and Claude, a pair of storytelling birds, welcome you to this charming attraction that delighted audiences from opening day. “Have a great show, a real Tropical Serenade!” we hear at the end of their banter, and the doors magically open to guide us into the Sunshine Pavilion. You’ll be transported to a tropical paradise where birds sing while telling lighthearted jokes on a variety of set pieces, and even the flowers join in! The Tiki gods usher in a rain storm with lightning and thunder that shakes the walls, before calm is restored. And the last magic trick before you leave? “Everybody face the door, we’re going to make you all disappear!” Includes brief scenes of the Sunshine Tree Terrace and Tiki Tropic Shop. 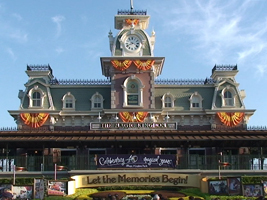 Immerse yourself in the Walt Disney World adaptation of the last attraction that was personally overseen by Walt Disney. This is the original opening day version of the beloved attraction, recorded before changes were made to the chase scene and pooped pirate. Your adventure starts at the Pirates of the Caribbean exterior, where the Barker Bird sets up the story of the ride (you’ll experience the full narration). 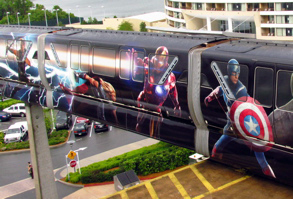 Continue through the queue and load areas, and sail past all of your favorite ride scenes as originally presented! “A parrot’s life for me!” squawks the Barker Bird outside of this updated version of the classic Disney attraction. 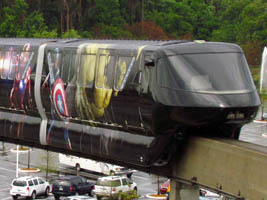 This ride-through showcases the changes that were made to the ride in 1997, including the chase scene where women now chase the pirates. 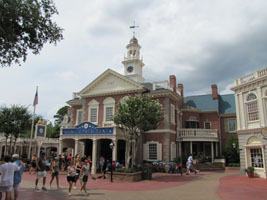 The Treasure Room scene near the end of the ride (unique to Florida) features two guards tied to chairs as pirates engage in horseplay – and gunplay – celebrating their conquest. 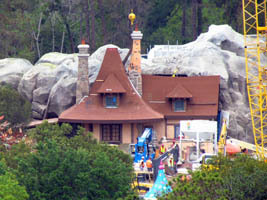 Includes the queue, exit ramp and a brief look at the House of Treasure! 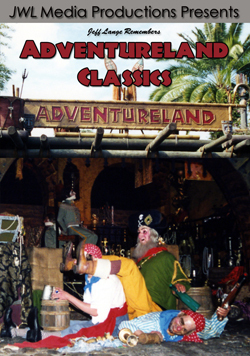 Relive these Adventureland Classics year after year or experience the magic for the first time by purchasing a copy of “Jeff Lange Remembers Adventureland Classics”. 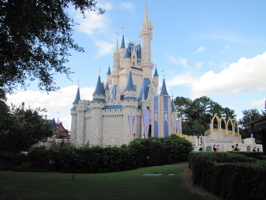 I spent yesterday at the Magic Kingdom, where there are many changes afoot. Entering past Cinderella Castle (below, right), I headed to Liberty Square. 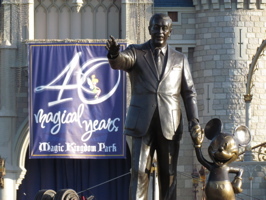 A year after the updated Hall of Presidents (below, right) premiered, it is still as popular and well received as it was then. I am currently working on a Hall of Presidents DVD that will feature the 3 previous versions as well as the current version and more. Check back here for details and release information.